The 2014 Major League Baseball season officially got underway last weekend (March 22-23) when the Los Angeles Dodgers swept the Arizona Diamondbacks in a two-game series played at the Sydney Cricket Ground. It was the first time an Opening Series has been played Down Under.The rest of baseball joins the fun on Monday, March 31, when the North American portion of the Opening Day tradition commences. To get in the spirit, here's a look at some memorable Opening Day moments from seasons past. The 2014 Major League Baseball season officially got underway last weekend (March 22-23) when the Los Angeles Dodgers swept the Arizona Diamondbacks in a two-game series played at the Sydney Cricket Ground. It was the first time an Opening Series has been played Down Under. 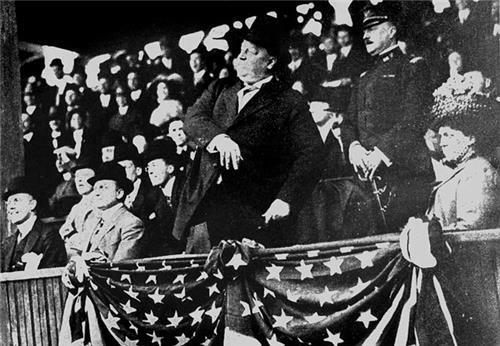 William Taft started an Opening Day presidential tradition when he threw out the first pitch to Washington Senators pitcher Walter Johnson at Washington D.C.'s Griffith Stadium in 1910. 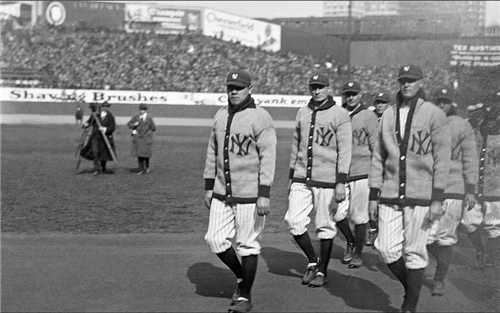 Famed slugger Babe Ruth (left) and the rest of the New York Yankees played for the first time at the newly-built Yankee Stadium on April 18, 1923. 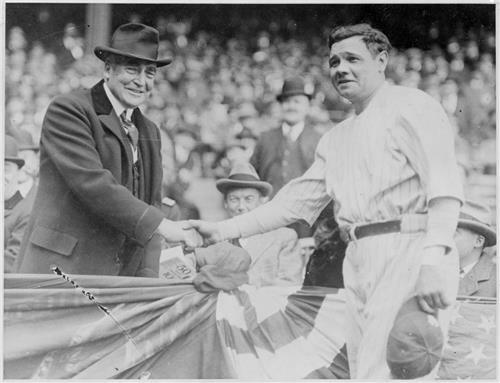 New York Yankee Babe Ruth greeted President Warren Harding before Opening Day at Yankee Stadium in 1923. Harding died in office less than four months later. 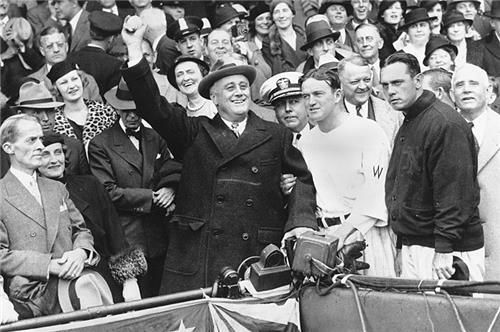 President Franklin Delano Roosevelt threw out the ceremonial first pitch of the 1933 baseball season at Washington D.C.'s Griffith Stadium. FDR's eight Opening Day first pitches are the most by any president. 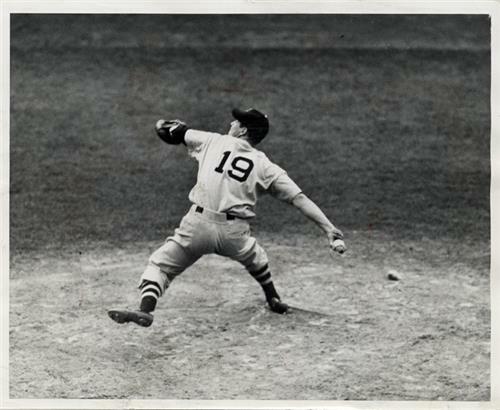 Cleveland Indians pitcher Bob Feller threw the only Opening Day no-hitter in baseball history on April 16, 1940, when he blanked the Chicago White Sox, 1-0, at Comiskey Park. 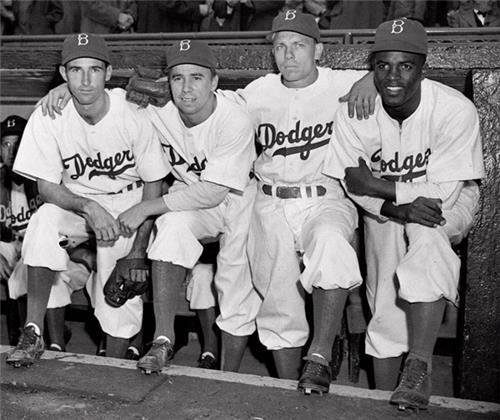 History was made on April 15, 1947, as Brooklyn Dodgers shortstop Jackie Robinson broke baseball's color barrier, becoming the first African-American to play in the Major Leagues. He walked and scored a run in the Dodgers' 5-3 victory over the Boston Braves. 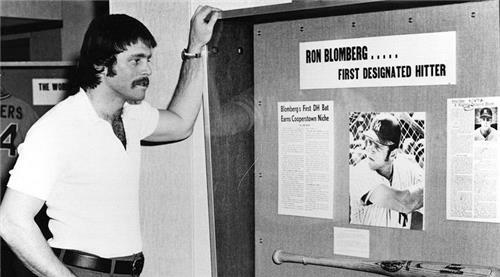 New York Yankee Ron Blomberg recorded the first official at bat by a designated hitter when he walked in a run in the first inning of his team's Opening Day loss to the Boston Red Sox on April 6, 1973. Atlanta Braves slugger Hank Aaron was congratulated by teammates and foes alike after tying Babe Ruth's career home run record of 714 in his first at-bat of the season on Opening Day against Cincinnati on April 4, 1974. He broke Ruth's record with his 715th home run four days later. 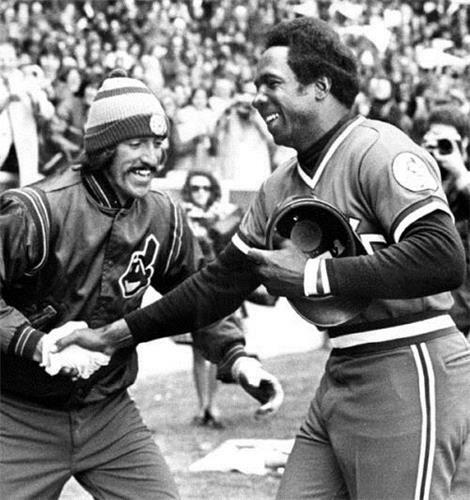 Frank Robinson celebrated his debut as the Cleveland Indians' player-manager by hitting a home run in his first at bat on Opening Day, 1975. Robinson was the first African-American manager in Major League history. 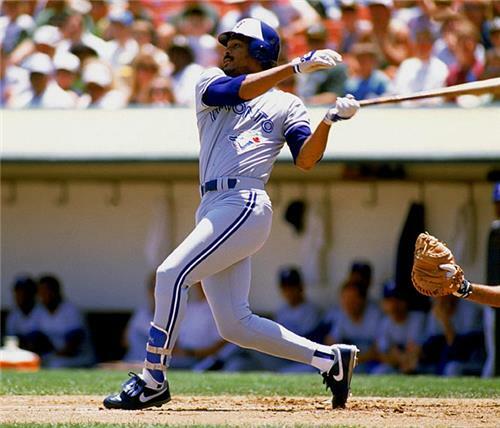 Toronto Blue Jays outfielder George Bell started 1988 off with a bang, hitting three home runs against New York pitcher Brett Saberhagen on that season's Opening Day. 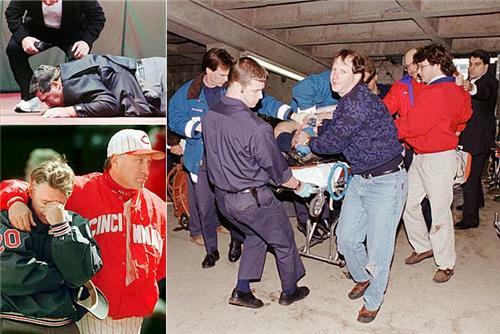 Tragedy struck baseball on Opening Day in 1996. 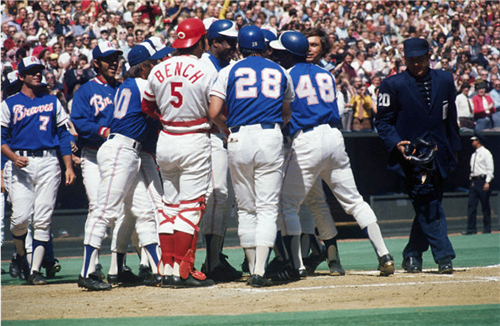 Just seven pitches into the game between the Expos and Reds in Cincinnati on April 1, home plate umpire John McSherry called time out. He then collapsed and died of a massive heart attack.